Breast cancer is the most common types of cancer that mostly affects women. Each year a large number of women are diagnosed with this type of cancer and many of them die because of it as well. What are the statistics for breast cancer cases? What are the mortality rates? How many deaths can be prevented with proper treatment? The following are some of the predictions made by the American Cancer Society about the cases of breast cancer in the United States for the year 2013. The number of new cases of invasive breast cancer that are going to be reported in women will be about 232,340. . The number of new cases of carcinoma in situ (CIS), which is a non-invasive type of breast cancer, reported in women will be about 64,640. Breast cancer is going to account for the deaths of about 39,620 women. The above statistic is from American Cancer Society Breast Cancer Facts & Figures, 2005-2006. During the period from 2006 to 2010, the median age of the women that died of breast cancer was around 68 years. Among the women whose deaths were caused by breast cancer, 0.0% were 20 years old or less, 0.9% had ages in between 20 and 34, 5.3% had their ages in the 35-44 bracket, 14.6% had ages in between 45 and 54, 21.6% had their ages in the 55-64 bracket, 20.2% had ages in between 65 and 74, 21.5% had their ages in the 75-84 bracket while 15.9% were over the age of 85. However, since 1990, a consistent decrease has been seen in the number of deaths caused by breast cancer in women that are below 50 years of age. This decrease in death rate can be attributed to the advances made in the treatment methods, more awareness in the women about the disease and development of diagnostic means that detect the presence of the cancer at an earlier stage. Below is a chart of death rates by race. According to the World Health Organization (WHO) the use of early detection techniques can help in decreasing the death rate in patients suffering from breast cancer. The first early detection methodology is education that will help the patients in recognizing the signs of the disease and consult a doctor as soon as possible. The second early detection methodology is screening programs like mammography that will make it easier for the doctors to identify the presence of cancer in a patient at an earlier stage well before the symptoms begin to appear. Women having relatives that have been diagnosed with breast cancer are twice as likely to develop breast cancer. Approximately 15% of all the women diagnosed with breast cancer have a family member that already has breast cancer. Mutations of genes like BRCA1 and BRCA2 are among the common causes of breast cancer that account for about 5-10% of all breast cancer cases. These gene abnormalities can increase the risk of development of cancer in a woman by almost 80%. Moreover, women having breast cancer because of these mutations get diagnosed much earlier when they are young. Gene mutations are also considered the reason for the development of ovarian cancer as well. 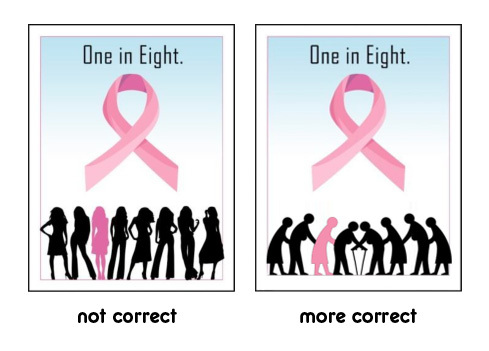 85 out of every 100 patients of breast cancer do not have any family member suffering from this disease. The reason for the development of breast cancer in these patients can be attributed to genetic mutations caused by old age instead of mutations that have been inherited. Only 10% cases of breast cancer in men occur because of BRCA2 mutation while the numbers are even less for BRCA1 mutation. The prominent factors that increase the risk of development of breast cancer are old age and gender. The period between 1999 and 2005 saw a decrease in the number of cases being reported in the US by 2% per year. However, this decrease was observed only in the women older than 50 years of age. It is believed that the reason for the this decrease is down to the reluctance of the women to use Hormone Replacement Therapy (HRT) after a Women’s Health Initiative study that was published in 2002 claimed that HRT was the reason for breast cancer in most women. The death rates of breast cancer are the highest among women in the U.S. except for lung cancer. .
For women in the U.S, breast cancer is the most frequently diagnosed type of cancer after skin cancer. Every 3 in 10 women suffering from cancer in America are patients of breast cancer. African-American women who are under the age of 45 have a greater risk of developing breast cancer than white women. Deaths caused by breast cancer are most common in African-American women. Women belonging to other races have a limited chance of getting affected by breast cancer. As many as 2.6 million women survived breast cancer in the U.S. in the year 2011.